It was the weekend before Thanksgiving 2004, and our eldest had just come home from the barn where she rode. We were in the kitchen on the following Wednesday, the day before Thanksgiving, when we heard the back door open and close. Then silence. And, of course, conniving daughter that she was, she knew full well that by Monday mom would be in love. And she was. There was one more hurdle. Paul stated that she would have to go to the vets for an assessment of her mix. And if there was ANY Pit Bull in her at all, then she would have to go. She went to the vet’s and was given the all clear. It was about six years later, Grace fully ensconced as the loved family pet, that the children reminded Paul around the dinner table that he would not have allowed her to stay if she had any Pit in her. They then all laughed and brought up some Google images of a Black Lab-Pit Bull mix, and there was Grace staring at Paul from every one of the images! 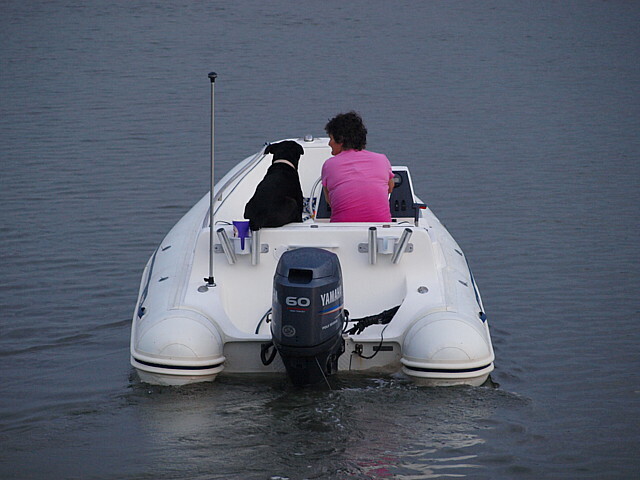 And that is how Grace, who would become The World’s Best Boat Dog, came into our lives. She was only a couple of months old and was “as cute as a button.” Initially she looked up to Rosie and was dutifully subservient. But as she grew bigger and Rosie grew older she started to come into her own. Rosie never liked going on our boat, whereas Grace loved every minute of it. For some reason she never liked the pool at home, but plonk her on a sandbar and she was covered in water and wet sand within minutes. We lost Rosie when Grace was about three. And then she really ruled the roost. She was with us every boat trip. She loved watching the children wakeboard and tube past the big boat, and she really loved it when Sian went off the swim platform and swam for the beach. She would lean out over the swim platform, not sure whether to jump or not, see Sian getting further away and “splash,” in she went to follow. Her favorite pastime when at anchor? 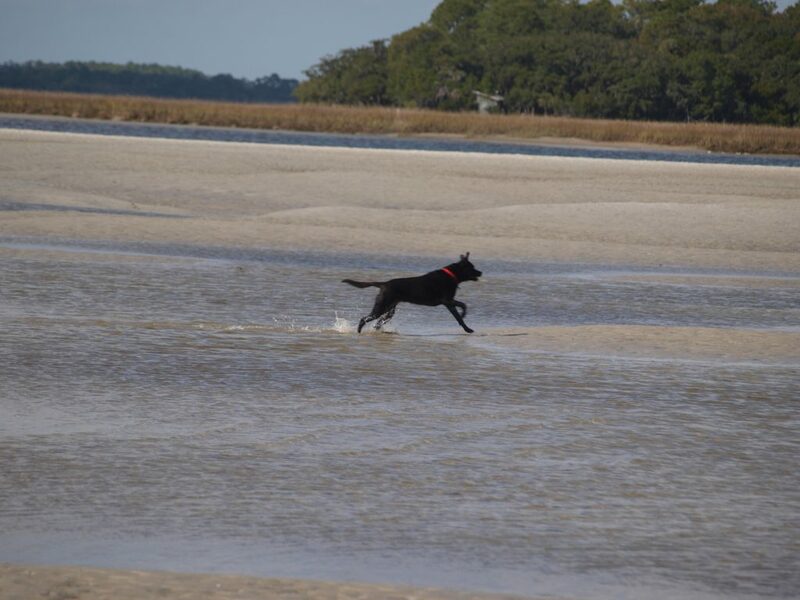 – chasing the flocks of little birds on the sand bar. This meant plenty of times mis-judging how deep a tide pool was, with the result she went nose first into the water! She loved people, and didn’t seem to care how covered in water and sand she was when she ran up to them. 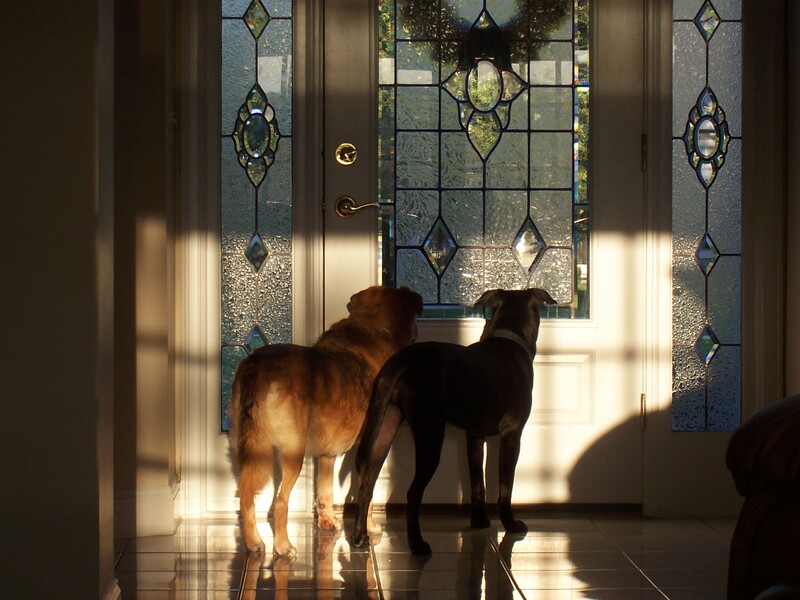 Now other dogs, were not loved so much. Any time another dog hit the beach she had to be dragged off it before a fight ensued! We moved homes when she was nine and moved into a development with a yacht club, which we joined. 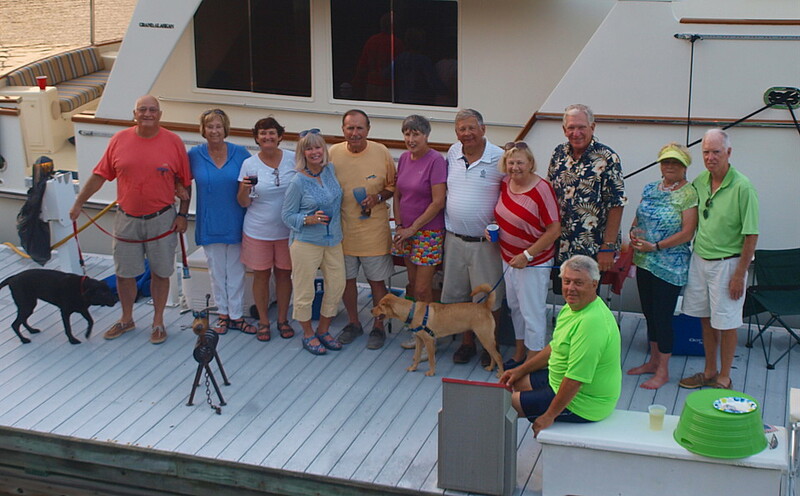 She loved her yacht club membership – and got to meet everyone on club trips and events. We basically had to take Grace EVERYWHERE with us or put her into a kennel. If we left her at home she got annoyed with us and ate doors! We had friends who offered to take her in when we were away – but we dare not have them do that as she would probably eat their doors as well! She was on boat trips all over the South East, to Fort George River, St Augustine, Palm Coast, St Simon’s, Hilton Head and Savannah. Paul was retiring at the end of 2016 and we had a big cruise planned for the three of us on Sonas – three months in the Exumas, leaving on March 2017! Then, September 2016. Paul was in New Jersey on business and Sian took Grace to her vet’s for a regular visit. The vet called Sian in and told her the bad news. Grace was very ill, she had an auto-immune disease and she had not months, but weeks to live. Sian was devastated. Grace was really her dog. Paul traveled a lot with work and Grace was Sian’s companion. Grace and Sian took long walks at least twice a day and became well known in the neighborhood. After the shock wore off Sian called the vets office and spoke to Grace’s favorite assistant and asked if there was anything she could do. She was told to try giving Grace half a steroid tablet every other day along with a anti-acid to help minimize any tummy problems. But clearly we would now be going to the Exumas without her. But even more clearly, Grace was NOT listening to her vet! Thanksgiving came and she turned 12. Christmas came and she was still going strong. Paul retired and New Year passed and she was still here. 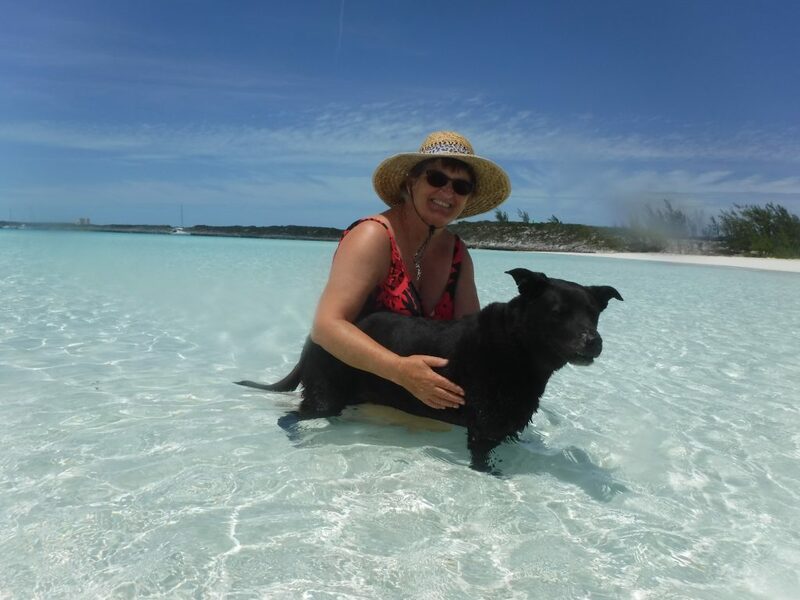 So we added her back into our plans for the Exumas. And when we set off in early March 2017 she was right there with us. And enjoyed every minute of the three months we spent there, terrorizing Bahamian birds, green turtles, sting rays, and sharks! For the rest of 2017 she came with us everywhere we went on the boat, back to Palm Coast for the Fourth of July weekend, St Augustine for the first weekend of The Nights of Lights, and a couple of trips to Fort George River. But as the year came to a close we could see that Grace’s boat days were coming to an end. She was now on a full steroid every other day, sometimes every day. She had large lumps on her body and was walking in obvious discomfort. Finally on March 8th we took her back to the vet asking him for his honest assessment. After a significant time on the floor with Grace, and finding another lump in her neck, the vet told us that she was in pain, and it was time. He asked if we wanted to do it there and then, but we decided to bring Grace home for a short time to say goodbye. The vet loaded us up with pain meds to help her through. We spoke to the children and let them know. On March 21st 2018 we said goodbye to The Best Boat Dog In The World. And we miss her terribly. The life and times of Grace.